After an underwhelming theatrical run in the US, the Wachowskis' and Tom Tykwer's latest, CLOUD ATLAS, drifts into the UK on the 22nd of this month. Camus is beguiled, astonished and puzzled in unequal measures. 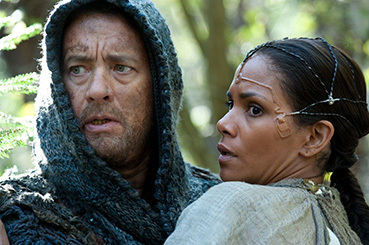 "In short, Cloud Atlas spends half its time wanting to be The Simpsons and the other half The Bible." "People will try to will Cloud Atlas to be rejected. They will call it messy, or complicated, or undecided whether it's trying to say something New Agey-profound or not. We don't want to say, 'We are making this to mean this.' What we find is that the most interesting art is open to a spectrum of interpretation." So, at last, it's time for me to recognize a unique piece of work that is so difficult to pin down and so easy to be befuddled by. Is it a bloated, pretentious, soul-reincarnation piece of puffery? Or is it a bold, wonderfully acted, marvelously directed, superbly cut, huge, ambitious lunge at visual narrative poetry? Oh, and let's not forget the inspiring score. Let's just say that if I thought the former, there would be no review on this site. I live in latter-land. I was utterly knocked out by the film but be aware, it may take a few viewings for it to have the directors' desired effect. With only a couple of screenings under my belt I'm anxious to get a few more in. It's often the case that a film's greatest strength is also its principal weakness – the relative originality of its presentation. Your average cinemagoers (who are they, exactly?) have not been weaned to readily accept a movie narrative told in this way. 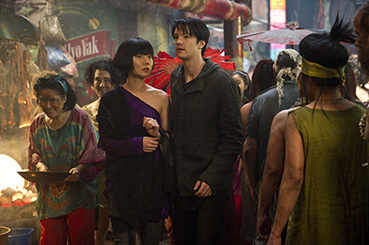 Cloud Atlas has the balls to go against the 'event' movie paradigm and for that alone I would be singing its praises. But there's a lot more to sing about. Every now and again, you come across a movie that (forgive the cliché) defies description, punches shallow analysis in the solar plexus and makes you bow in reverence to the crazy souls who poured a very large sum of money and talent into the most startling and original 'big' movie that I've seen in years. I'm going to make a prediction despite its poor performance during its US run from October last year. This movie will eventually be hailed as a classic, a one-off to be sure, but a piece of cinema that provokes and asks a great deal of its audience. Like Blade Runner, which also tanked way back in 1982, Cloud Atlas will emerge in a decade or so as a bold, brilliantly acted and directed work that will be endlessly re-examined and pored over. As predictions go, it's a no-win scenario for myself. If I'm wrong, no one will remember or care and if I'm right, no one will remember or care either. It may have flopped with the great Stateside unwashed but I read with joy that the movie was given a ten-minute standing ovation at the Toronto Film Festival last year. Hail Canada! If there are dozens of reasons for this reaction, I can only guess at a few. I just can't see how anyone 'gets' this movie after a single screening. And yet the amazing number of its Oscar nominations tells another story. The acting, music, sound design, editing and direction, not to mention the special effects, costume and make up are almost universally top notch (OK, there are a few prosthetics that call attention to themselves). Each and every one of these crafts is able to knock confidently on Oscar's door – and it's not as if the participants in this insane adventure are Oscar averse. The American Academy (bless) completely – and one assumes disdainfully – ignored Cloud Atlas (for shame) and offered it no recognition at all, not one single, itsy bitsy nomination. That, my friends, is utterly inconceivable to me – even if they all loathed the film, the craft on display is stunning. Can you imagine the Academy's thinking? "What about this Hanks thing, Cloud Alias? Did any of you get through your screeners?" "Tom's got a few gongs and Halle's already had one... They won't mind not getting a nod." "And that Larry Matrix fellah is now a woman – and with pink hair extensions, can't be doing with that." "And what's all that nonsense with the shooting stars?" "Did the composer chap really have to be a homosexual?" "And it is technically a German film after all..."
"Oh, it's foreign! I see now." "If we're all agreed, let's pass on... uh, what's it called again?" "Doesn't matter. It didn't make a cent here. No one cares. Next!" "Well, for that slice of Americana, what categories don't we nominate?" There are six in six time frames, all proudly and mind-bogglingly intercut. Not that it matters but just for completeness' sake... (and yes, I'm being deliberately cryptic because half the fun is figuring where these narratives are going). Families fall and are re-made. The six narratives feature the same seven or so actors in wildly different roles, some made up to be cross-race and in a few cases cross-gender. The thematic link is a birthmark of a star and its trail that immediately brought to mind a graphic from the story of "The Little Prince" by Antoine De Saint Exupéry. It wouldn't surprise me at all if that was intended. I must stress (and repeat) that I do not think it is possible to get everything this movie is offering in one sitting. We're presented with a six-course banquet and given only minutes to pack them away in doggy bags. The first bite, as they say, is with the eye and that's all you have time for on a first pass and it looks glorious. The movie practically demands you return to it by its very nature. This banquet has no 'eat by' date. To some this may be pushing it a bit – a film you need to see more than once to fully and truly 'get it'. To others, each revisit will yield new themes, new ideas and an altogether expanding (and to use the word du jour) immersive experience. Two viewings in and I'm itching for more. I want to convey how I responded to it without the smart-arsery, know-it-all status afforded me by the depths of information (mis and otherwise) on the web. That said, I am writing this review accompanied by its rather sumptuous score by co-director Tykwer, Johnny Klimek and Reinhold Heil, so I'm soaking in sound as a surrogate for many more revisits. How many huge movies give the audience that power, that choice of engagement? For their courage, I salute the filmmakers (and their backers) and for better or worse in terms of what I can say about the film while I'm still reeling, here are my impressions of this astonishingly brave stab at cinematic art. Let me clarify. This isn't the 'die for your comrades' bravery. This is fiscal and career-daring chutzpah. The Wachowskis have experienced both ends of the success line (with The Matrix and Speed Racer at each end respectively) but still they are (together with Tykwer) pushing big cinema into places many wish it would not go. If this movie was made for five million, had no stars (except the shooting variety) and a very modest FX budget – and crucially, I feel, a new, single unknown director – we'd be shouting its and the director's name from the rooftops. I honestly think that every now and then the Academy wants to kick a movie – undeserving of such lower limb effort – in the balls. Another great thing about Cloud Atlas is that it has balls of steel. I hope the Academy's toes take a painfully long while to heal. With a film like this, crammed as it is with so much detail and subtlety, I want to go back and note what passed me by, to pay more attention to the intersections, to really swim in the gorgeous images offered up. I marveled at the density and multi-meaning nature of the editing. Please note that characters never act in dishonest ways. There is nothing arcane or deliberately 'weird' planted in any of the sections. But what there is, is invention and artistic inference by the bucket load and if I had to say anything broadly negative about the film, it would only be my own difficulty in understanding the invented language in one particular narrative strand (the one featuring Hanks as a futuristic Maori). Remember the children's future-evolved lingo in Mad Max Beyond Thunderdome? "Captain Walker!" This is five times more twisted. Next time, I'm going to really pay attention. But as Hitchcock once maintained, a good movie is one from which the sound could disappear and you could still follow the plot. Just as well. Hanks is trying to live down a cowardly act, deflect the attentions of the personification of his own fears ('Ol' Georgie', played inevitably by a sneering be-hatted Hugo Weaving), as well as keeping his family safe and philosophising about what's in the stars. He delivers this in a halted and twisted pidgin English of the future that I rarely understood... I take it that it's taken from the novel? Easier to understand, written pidgin than spoken, I trust. Thank the gods the visuals and editing kept me absolutely transfixed. Subtitles option ON for the oncoming Blu-ray, methinks. Ah, the editing... Jesus! Thematically, stylistically, intellectually and viscerally, there has not been a better-edited movie that's come out of big-movie Hollywood (or even big-movie Germany) for a long, long time. The fact it wasn't even nominated for an Oscar is an absolute disgrace to those who presume to judge the craft. Maybe BAFTA will give it a shout next year. It's axiomatic that big Hollywood films are cut very well by editors who know their juju – and some good editors are goaded on by their directors to make a nonsense of the craft and narrative by making unjustified, hyper-accelerated cuts. (Marc – "I want it like a bullet!" – Forster, for example). Just how much of those creative decisions are made before the Avid editing suite gets started up in the morning is a question for debate. Is the editorial transition written in the script or does it come out of the directors' heads? Regardless, it still has to be fashioned to work. The only thing I can think of to explain Cloud Atlas's editorial snub is that the Academy voters saw the editing of Atlas as a direct result of the directorial contribution and planned intent and less of an individual editor's creative contribution. Whatever they thought, they were not entirely correct in their conclusions. Cloud Atlas is a prime example of editing as a powerful force of narrative precision. In being precise, the ideas split and multiply which seems to be a contradiction. Welcome to the art in film. I find it unbelievable that Cloud Atlas has been so wantonly brushed aside. The Academy ignoring the film's oh-so obvious technical achievement is like watching a sloth take evasive action. BAFTA, please right this injustice. Editor Alexander Berner's work is breathtaking even if Tykwer and the Wachowskis had planned each segue down to the frame. I haven't been so charged from an editing perspective since the heady days of Nic Roeg's editorial ascendancy. And I'm not just talking about flashy associative cutting. I'm talking about ideas, meanings and themes, aspects so much harder to get right in the editing suite. It's so much more difficult to convey complex ideas with a simple juxtaposition of one frame and the next. I just remember the thrill as we passed from one age to another with a thematic link or in some cases a direct match cut that made me fizzle inside. Keith David is a revolutionary leader in the future Neo Seoul, Korea, 2144 and the cut back to his 70's persona made me cackle with delight. Its subtlety, if this is possible, hit me like a gold brick but only on the second viewing. Blink and you'll miss most of them (and here we enter the desire for repeated visits). "All boundaries are conventions, waiting to be transcended. One may transcend any convention, if only one can first conceive of doing so." It's that 'conception' part that gets me every time and as I look up at iTunes (this is going to really make you think I'm making all this up) the cue playing of the soundtrack is 16. All Boundaries Are Convention... You're just going to have to trust me on this. And please have a little faith that the blockbuster's own boundaries can be successfully subverted and transcended. Enjoy, time and time again.